The first bucket is the bucket used for soapy water. Use whatever soap you usually use (bio-degradable is best) and keep it as hot as you can stand without scalding yourself. When the water gets soiled and the soap is not breaking grease down like it should; the soapy water needs to be replaced. The second bucket is used for rinsing washed dishes. 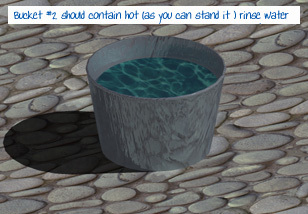 The water in this bucket should be kept as hot as you can stand it without scalding yourself. The water should stay pretty clean and clear. If it gets cloudy, soapy or soiled, it should be replaced. The third bucket is used for sterilization. It should contain 3 oz. of chlorine bleach to 5 gallons of water. The water should stay pretty clean and clear. If it gets cloudy, soapy or soiled, it should be replaced.